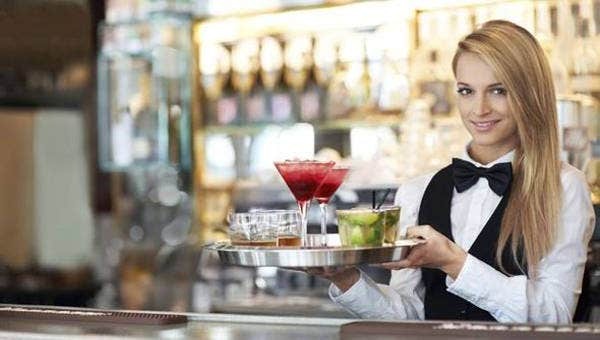 Waitresses are the employees of a restaurant or any food establishment tasked to serve the food of the business from the service or food pick-up area up to the tables of the customers. One way of assuring that you will get a waitress job, if you are targeting on,e is by creating an outstanding resume that can showcase your qualifications and expertise. 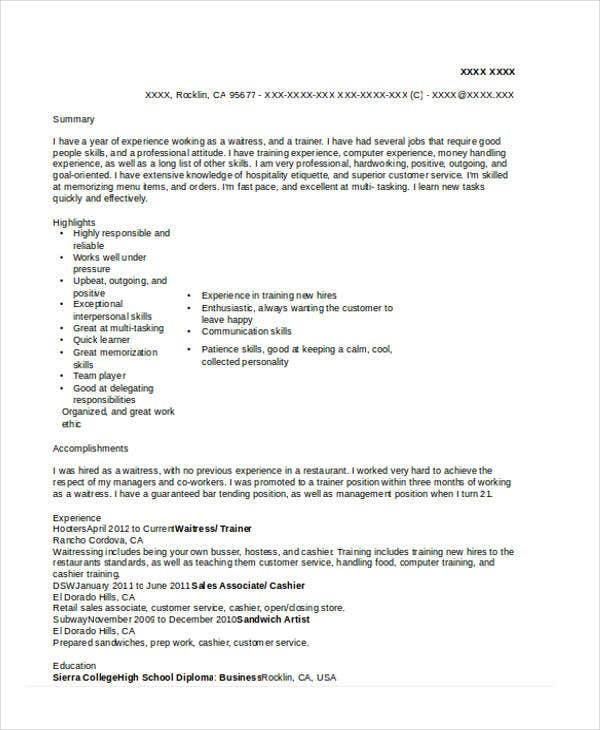 This post is a list of waitress resume templates and samples that you may use as reference in creating your won waitress resume. 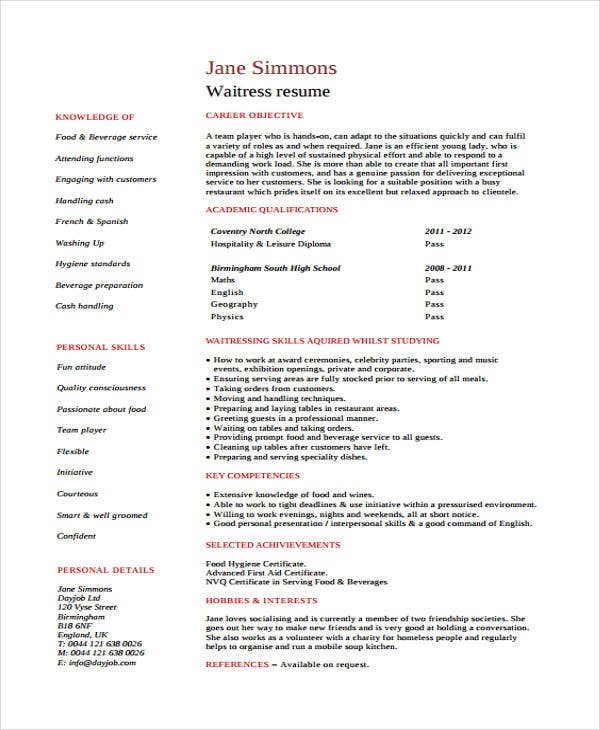 Other than that, we can also provide you with other kinds of General Resume samples. 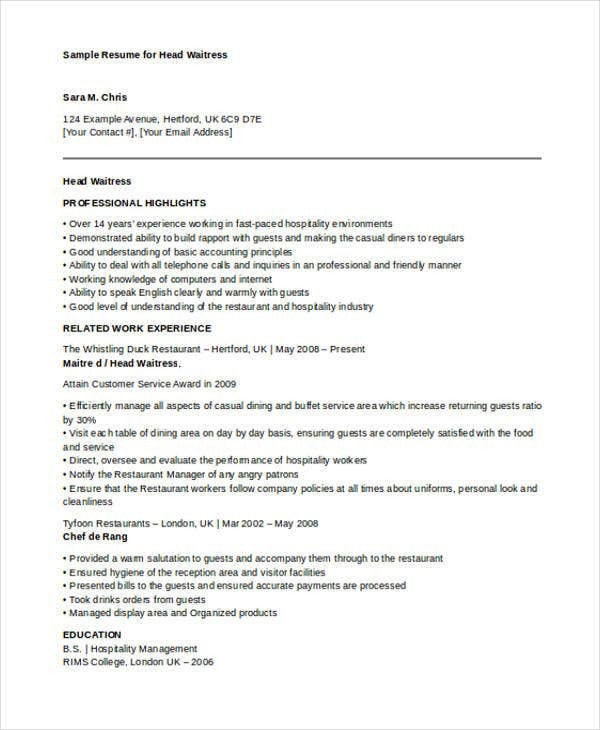 We can provide you with more templates of Restaurant Resume Examples in the provided link for additional references. Make sure that you are aware of the kind of restaurant or food establishment you’re applying for. Assess your qualifications and identify whether fits the requirements of the waitress job position offered by a business. Organize your resume in a way that you can give focus to your skills, experiences, qualifications and other competencies. 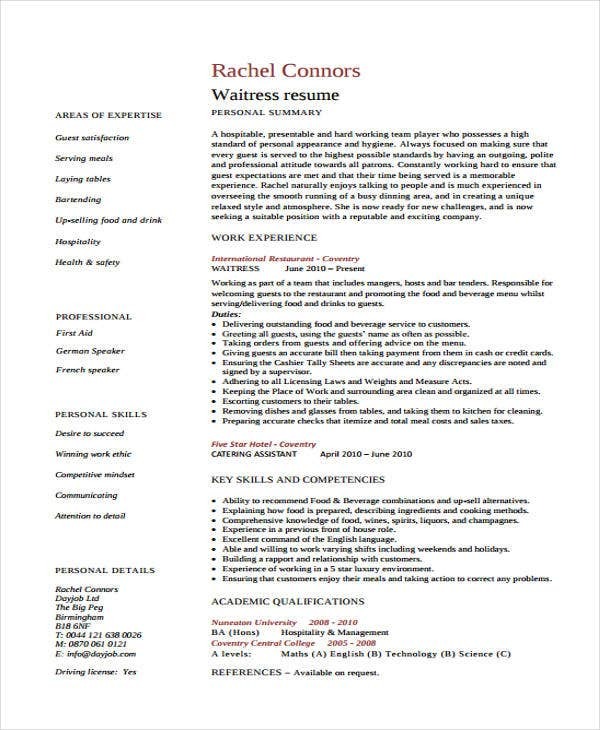 Other than our waitress resume templates and samples, our Writer Resume Templates and other kinds of Basic Resume Template samples are also available for download. Ensure that the template that you will use is appropriate for the specific waitress position that you are applying for. Identify the needs of the company so you can present specific items in your resume’s content that can be very helpful in your application. 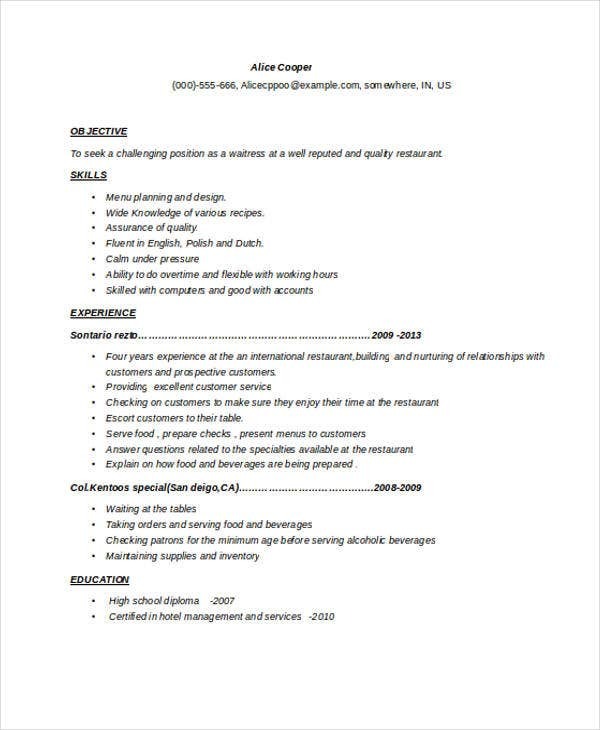 Compare your resume to other Food Service Resume Templates so you can see whether you need to improve yours or not. 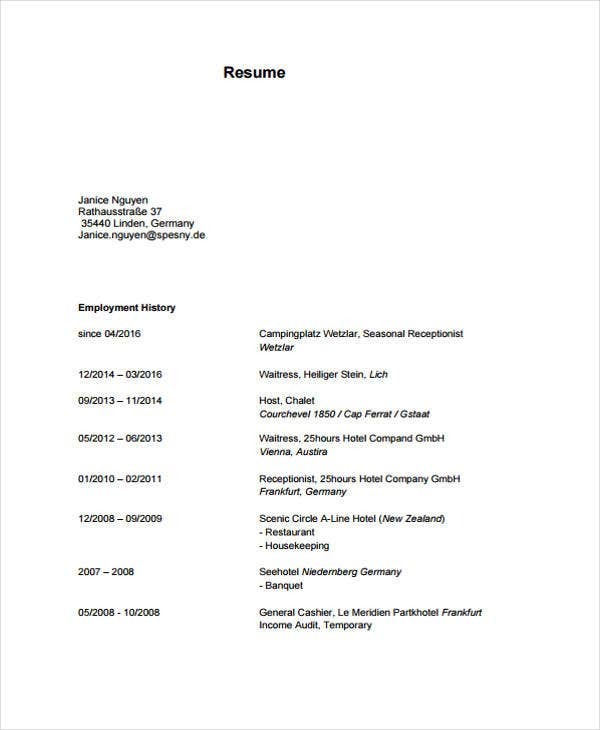 Select a waitress resume template that has the structure and format that you are comfortable using. 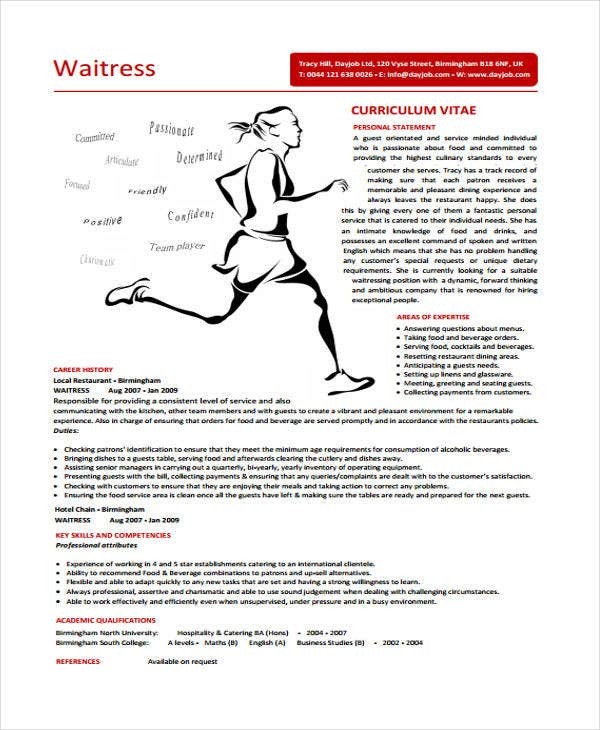 Make sure that your waitress resume template is comprehensive and all the items present in the document are understandable and written in a professional manner. Other than our waitress resume samples and templates, our samples of Creative Resume Templates are also available for download in the provided link.